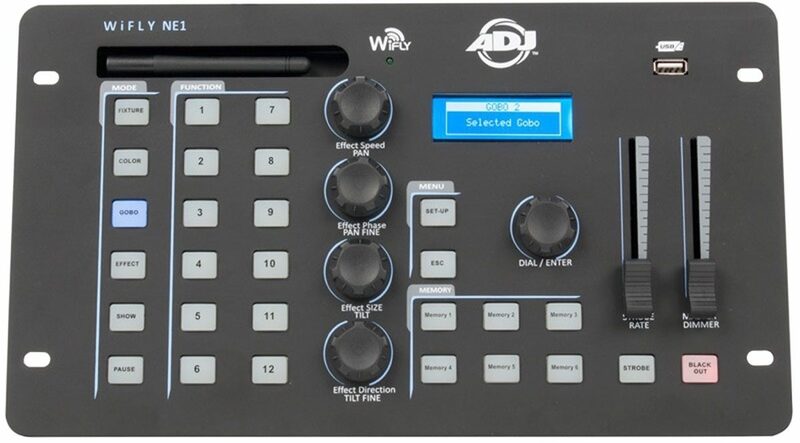 The American DJ WiFLY NE1 from American DJ is the DMX controller you've all been waiting for; a real game changer and the most universally-accessible ever. Offering you a versatile DMX control solution, the WiFLY NE1 is equipped with a built-in FX generator and WiFLY transmitter, making it compatible with a range of fixtures from ADJ's WiFLY series. Along with wireless DMX transmission, the WiFLY NE1 also have a 3-pin DMX output for fixtures without wireless DMX. 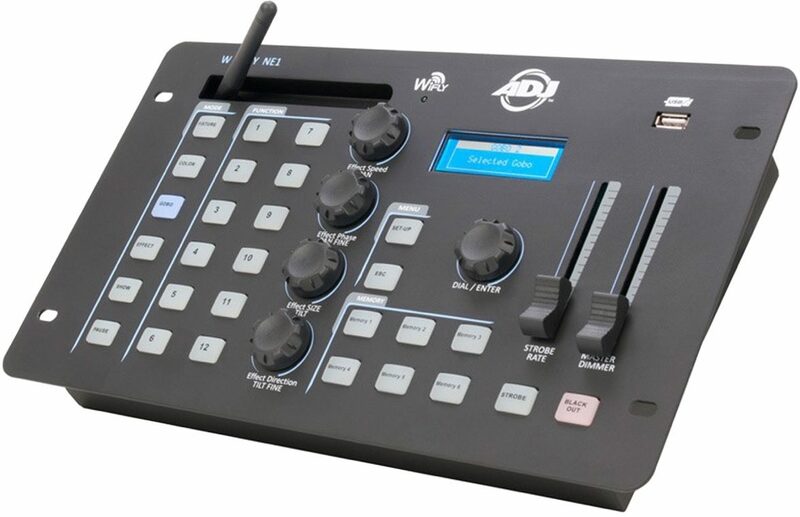 There's a reason ADJ named this user-friendly controller the WiFLY NE1, and that's because it really can be used by just about "anyone" -- no matter what your level of experience or knowledge of the DMX protocol. Because the compact controller simplifies each element, giving you the features of a larger, more powerful controller laid out in a convenient, user-intuitive way, a basic grasp of DMX is all that you need. With no sub-menus to complicate things, you can click the setting you want to adjust -- with buttons for fixture, color, GOBO, effect, show and pause -- and change it using the on-board dials and numbered buttons. So, you can easily select between one and 12 fixtures, as well the pan/tilt settings, color settings and effect settings for each. With independent faders and buttons for the strobe effects and master dimmer, you also have easily accessible control over these atmosphere-enhancing features, allowing you to create more pure lighting excitement from behind the desk. You'll find that setup is simple too. Fitted with a blue-backlit LED screen, the WiFLY NE1 lets you select the lights you're using from its fixture library, which includes an expansive list of popular ADJ products. You can also create profiles within the library, adding your own fixture profiles and data using the controller's universal USB port. While the WiFLY NE1 is incredibly easy to operate, its versatility really comes from the built-in WiFLY, which enables you to control as many as 12 individual WiFLY-compatible ADJ fixtures using wireless DMX. This means you can increase the scope of your wireless setup, while still enjoying access to the simple but effective DMX operation offered by the unit's user-friendly layout. For those of you that also want control over your non-WiFLY units, the WiFLY NE1 comes fitted with a standard 3-pin DMX output. If you're a mobile DJ or entertainer on the move, the WiFLY NE1 controller really lets you take your lighting system to the next level, not only allowing you to do more with your dance-floor but giving you exciting creative options for the first dance, cake cutting and evening reception at events such as weddings, bar/bat mitzvahs, birthdays and other special occasions. On the other hand, if you're the owner of a small club or venue, using the WiFLY NE1 means that you can act independently, without having to rely on a lighting designer, thanks to its user-friendly layout. No matter who you are, with the WiFLY NE1 at your fingertips you don't need 'big desk' knowledge to get creative or achieve professional results.